OI! Not only heretical, but also plan ugly. The eyes are just creepy. No, there's more wrong with it. Adam and Eve being on top of the Earth, even if their posture is that of submission and humility, still suggests that they have dominion over the Earth, which is not the case. Also, the depiction of the dead Christ in the top of the image seems to suggest that Christ not in the same body as he was before the Crucifixion, and that he made a new body for himself for the sake of rising from the dead, and both bodies were assumed into heaven. Also notice how none of figures, not even the three figures intended to be the trinity, have a halo. 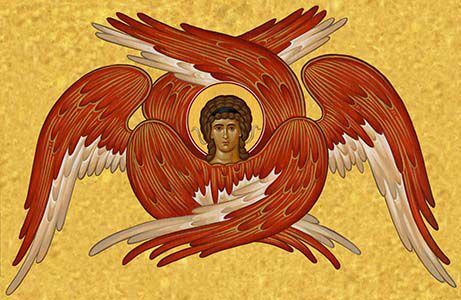 Finally, there are figures at the bottom, that due to the number of wings I think are supposed to seraphim, are not displayed according to the canon, and neither are the 'cherubim' that are around the three trinitarian figures. They should look like this, with the seraphim colored red and the cherubim colored blue. What is Dominika's image supposed to be? An 'icon' called "The Divine Liturgy". It developed from this, canonical, icon. It's commonly found behind the altar if an icon of the Theotokos with the Christ Child is not present. Does anyone know if there is a canonical icon called Holy Wisdom? I've only ever seen that one and this one. You would think they would have some basis from the canon, due to their age. Interesting that it's in Greek and Russian. I've seen ones with elaborate details like that, but they are usually Russian. I think there was a middleman involved, by the name of Robert Lentz. He added the egg, and then whoever made the one in white gave her a Bible, a red egg, and a blasphemous inscription, "I am the wife and the virgin." "St. Margarita on the Rocks." Is... is that Nikola Tesla? It looks like him, but based on the bottom left hand corner, it might be the inventor of the koulourakia. One version of the Christ the Great Hierarch icon, indeed! 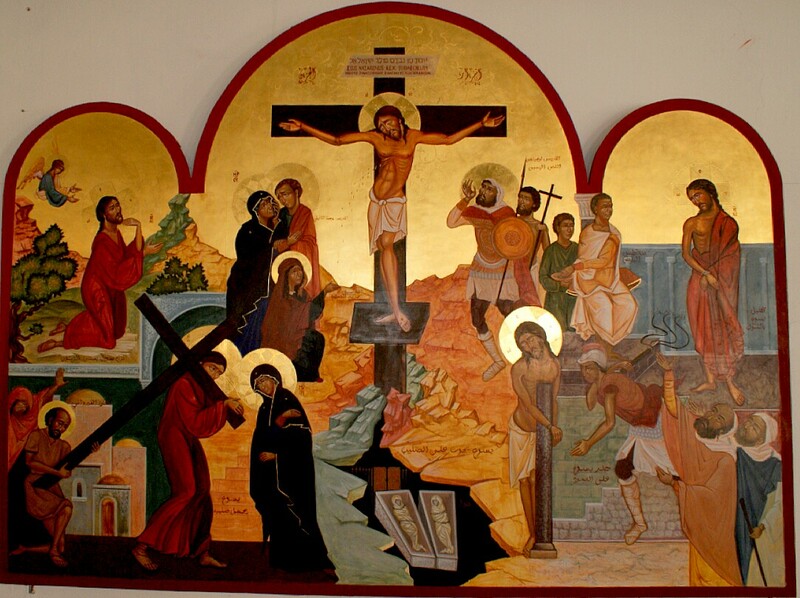 It appears on the back wall of the ROCOR cathedral in San Francisco main altar, and another version, with Christ the Great Hierarch overseeing the Great Entrance, is on the back wall at St. John the Baptist Cathedral in Washington, D.C. . 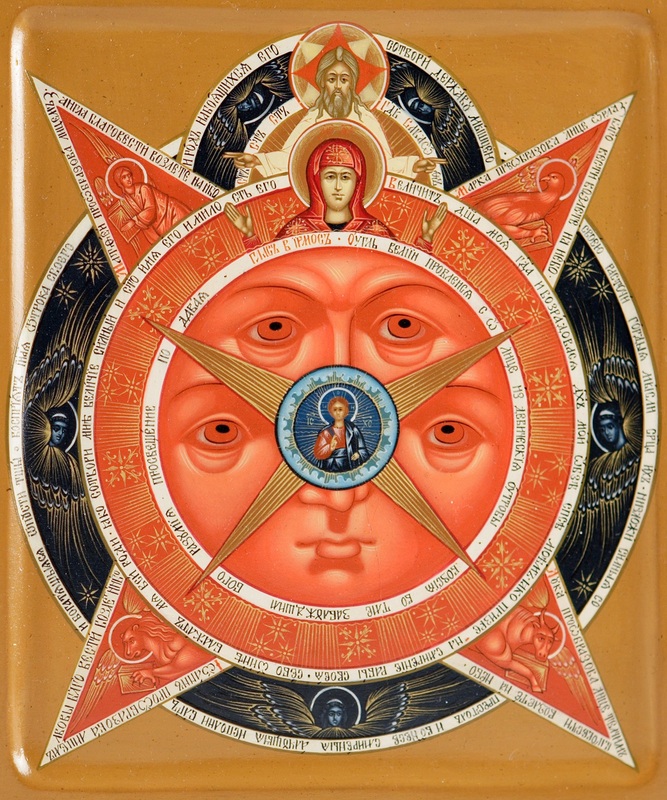 But the icon with the Theotokos on the steps and the Holy Wisdom icons are weird, to say the least. On Sts. Coffee and Chocolate, I'm guessing St. Chocolate is the chubby one? And who's the deity in the sky? Abba Mocha? I have a small icon of that. What all is it supposed to mean? It's the icon of the Synaxis of All OCNet Moderators. We are always watching you. Okay that did give me chills for a second. My guess is that the faces are some kind of statement about Christ as Preincarnate Wisdom. I think it's called the All-Seeing Eye, it must be some sort of reference to the omnipotence of God. I want to know why the disc face has four eyes. It's downright horrifying. Oh, you're a Cajun? I had a very good Cajun friend who owned a rather nice restaurant. I very much like all things "Acadian" except for rhe music. I dunno, I kinda like it. It's like a trippy album cover. I mean, it's not an icon, but it is kind of interesting. Cajuns would never have an icon like this. They'd have a super blue statue in a grotto in the front yard and a painting of The Virgin's Island at Pierre Part in the living room with little schlocky statues on the kitchen sink and a painting of the Immaculate Heart somewhere in the house. I'm not understanding the gaping hole underneath St. Stephen. 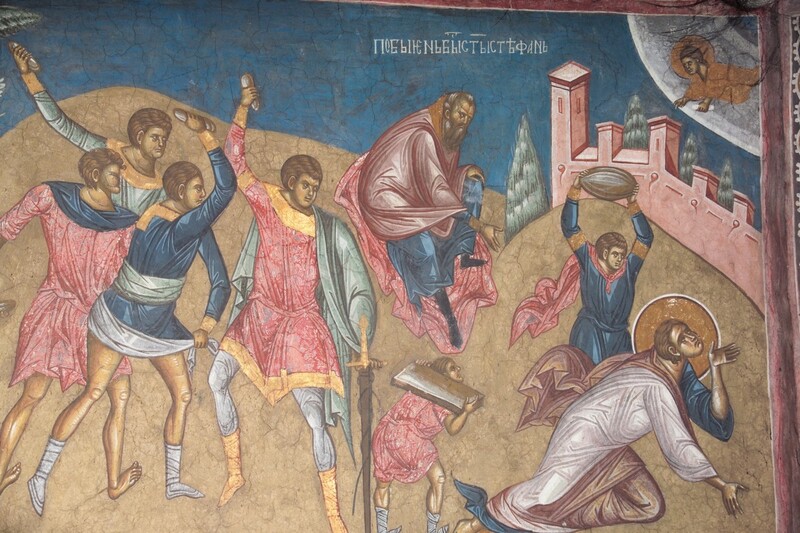 I also don't get why the people stoning are painted black, like demons. The painter also really wanted to depict them filled with hate. Nevertheless, we are getting rid of it. With a few adjustements it could be really nice. I would not at all defend such an icon but it is not uncommon to see references to demons as appearing "Ethiopian" in a lot of old Christian literature. Can an Ethiopian change his skin? But, this thread has suffered enough derails over the years lol. After 61 pages, I'm amazed that the word icon is still being discussed in the thread! Is this a Holy Family icon depicting them as Arabs? Probably historically accurate, but I would call it "good schlock". It's creative, but not for church, definitely.